in The Foreign Duck, the Native Duck and God in a Coin Locker. The Skinny: A comedy-drama about xenophobia, Bob Dylan and a bookstore robbery that proves entertaining despite numerous rather large plot holes. Director Yoshihiro Nakamura has a way with quirky characters and narrative reveals. Director Yoshihiro Nakamura seems to relish a good narrative twist, recently employing a drawn-out but very satisfying reveal in his 2009 film Fish Story. Nakamura's 2007 effort The Foreign Duck, the Native Duck and God in a Coin Locker also possesses a sizable twist, but it's one in the service of a darker story than the witty optimism found in Fish Story. The reveal is a bit forced, and in retrospect is not as convincing as it should be. However, the emotions and characters work, making the whole package of Foreign Duck, Native Duck an entertaining and solid one. Gaku Hamada (also in Fish Story) stars as Shiina, a nebbish who arrives in Sendai to attend university. The locals seem unfriendly, but one day while humming Bob Dylan, Shiina meets irreverent slacker Kawasaki (Eita, from too many movies to mention), who quickly and enthusiastically introduces Shiina to his oddball world. Kawasaki wants Shiina to ride shotgun with him on a bookstore robbery, the spoils being a special dictionary for their Butanese neighbor Dorje (Kei Tamura), who's heartbroken after losing his girlfriend Kotomi (Megumi Seki). Adding to the convoluted character connections, Kotomi was also Kawasaki's ex. However, there are holes in Kawasaki's story. Local pet store owner Reiko (Nene Otsuka) warns Shiina not to buy into Kawasaki's tall tales, and he says the same thing about her. Shiina isn't sure who to believe, and sometimes plays dumb when talking to both sides, with neither side really fooled by his duplicity. Nobody seems to want to come clean, and Shiina's interest is further piqued when Kawasaki repeatedly drives off in the middle of the night, up to who knows what. It's ultimately up to Shiina, his naive decency, and some impromptu detective work to find out the truth. 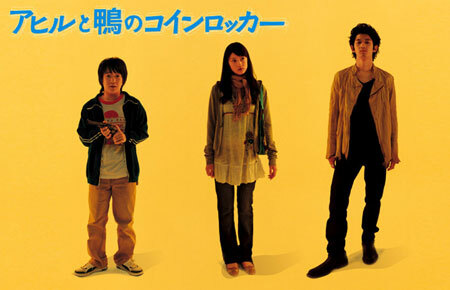 The film's title - relating to differing Japanese terms for ducks, plus one of the film's unique images - is cryptic but also a bit whimsical, belying the film's surprisingly dark content. The twist that Nakamura and co-screenwriter Kotaro Isaka (who also worked on Fish Story) drop on the audience feels earned, and it serves a very fine purpose, managing to excuse the film's rampant third act exposition as well as deepen not one but three of the film's characters. Nakamura employs plenty of flashbacks to fill in the blanks, but despite repeating some scenes, the flashbacks never feel indulgent or superfluous. Foreign Duck, Native Duck plays like a dry comedy before transforming into something heavier, and it's a change that surprisingly works. Nakamura draws out his scenes a bit, but his situations garner interest due to the characters and the various issues they face, such as Japanese xenophobia and instances of culture clash. Their issues also get layered into the film's events, cropping up unexpectedly and giving the narrative added resonance. The actors are effective, too; Hamada is a likable, decidedly dorky lead and Eita manages quirk and surprising charisma as ladykiller and would-be bookstore robber Kawasaki. It's Ryuhei Matsuda, however, who steals the show as a late-appearing character.